We live in a society that no longer seems to embrace aging. I remember how I felt when I realized I was broaching the age of 25, the age that society seems to have labeled as the pinnacle of success for women, and yet I wasn’t married, where I thought I was going to be career wise and I definitely didn’t have a family… I remember thinking to myself, hmm so… is life supposed to end now just because I’m not there yet? NO! That’s when it occurred to me that life after 25, or I should say Your Life After 25 is just beginning. Society had me, us, bound to so many ideas of who I should have been by this “chosen” age/time frame, however, I was just beginning to feel like I know who I am and what I want. So I decided it’s time to throw out my old lists and just live life with each day as a stepping stone to being the woman I want to be. There’s nothing wrong with having goals but being defined by your age doesn’t have to be the case anymore. Your Life After 25, “believe or not, it does go on”. If you had dreams of writing a book and started thinking “I’m too old to start it now”, who said so? don’t allow yourself to be defeated by not attempting to reach for your goals. If you’re worried about being single and finding that right person, there is no age limit to love… always remember if you don’t try you’ll always lose. You can choose to make today the beginning of the rest of your life, choose to aspire for greatness and to improve as a person. 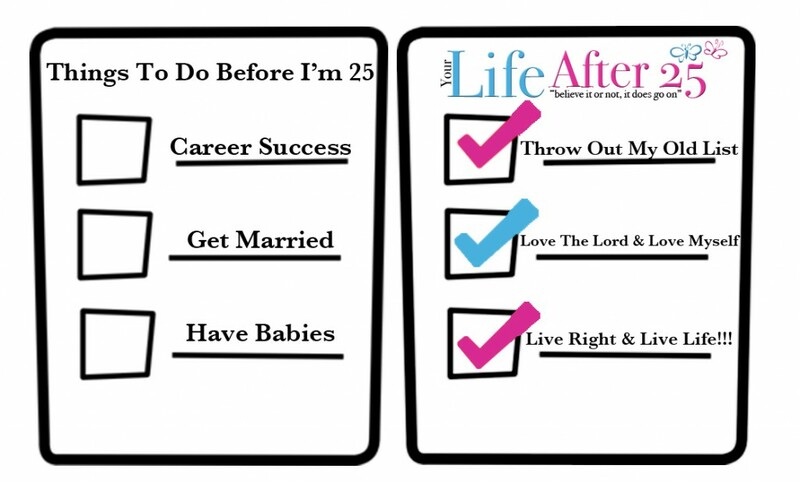 What is “Your Life After 25” about? Our mission is to help you throw out the old expectations of who you should be by 25 & celebrating who you will be after 25. With articles about life, health, relationships, fashion, current events, and much more… you’ll be able to learn new tips for self improvement in many aspects. We’ll also be doing interviews and featuring stories from people 25 and older who are doing extraordinary things and embracing life, my hope is that we can all inspire each other to improve upon ourselves. What’s life without a little fun? We’ll also be doing giveaways, reviews, have stories on entertainment and much more. So come along and start the journey with us and celebrate “Your Life After 25”. What Was On Your Checklist To Do By 25?